Sat., June 4, 2016, 8:32 a.m. In this May 25, 1965, file photo, heavyweight champion Muhammad Ali is held back by referee Joe Walcott, left, after Ali knocked out challenger Sonny Liston in the first round of their title fight in Lewiston, Maine. Ali, the magnificent heavyweight champion whose fast fists and irrepressible personality transcended sports and captivated the world, has died according to a statement released by his family Friday, June 3, 2016. He was 74. A GRIP ON SPORTS • Boxing isn’t a sport that dominates the nation’s consciousness anymore. Certainly not like it did 40 or 50 years ago when there was one man who was able to keep it in the spotlight all by himself. The brightest light in a dark time. But now Muhammad Ali is gone. Read on. • Time wins every fight. Not even Ali would argue that. But in Ali’s case, it didn’t win by a knockout. A split-decision at best. Ali was a brash young man when he won an Olympic gold medal as Cassius Clay. He was a polished boxer when he became the heavyweight champion of the world. He was Muhammad Ali when he fought the U.S. government in its ring and won. He did all of it before he turned 30. And he did so much more. He transcended his sport. He was the most widely known athlete in the world. The most commonly quoted. The most influential. His persona altered our thinking about everything, from the brutality of boxing to the brutality of war. He conversed with world leaders, lectured religious gurus and mingled with commoners. Heck, an argument can be made he invented rap. Even as he aged, he influenced us. Who can forget his appearance at the Atlanta Olympic, his body affected by (more-than-likely boxing-induced) Parkinson’s disease, looking old beyond his years? His lighting of the Olympic torch still transcends any athletic accomplishment at the XXVI Games. It’s easy to imagine elder Americans sitting around their TV on that night 20 years ago, many of whom cursed Ali and all he stood for in the 1960s, explaining what he meant to a new generation who had never really experienced his luminosity. Once again, Ali had backed Time against the ropes. But Ali didn’t invent the rope-a-dope. His final opponent did. And Time waited. As memories faded of Ali in Zaire, where he regained his title by outthinking and outfighting the seemingly unbeatable George Foreman, or of Manila, where the finale of the three greatest heavyweight fights of my lifetime occurred, a new image of Ali emerged. He had always been a statesman, in a way, but in his latter years he truly became a man of the world. Whenever he shuffled out into public view, the acknowledgements were overwhelming. Not just from politicians, who lined up to meet with him, but from the average person, from Nepal to France, from South Africa to Canada. 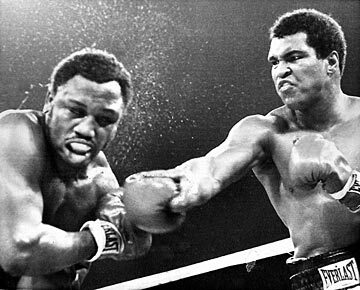 Folks who didn’t know the difference between an uppercut and a hook knew who Ali was – and what he meant. And yet, we all knew he was losing his fight. It ended yesterday. Time had won again. But it was a hollow victory. The man who was Muhammad Ali is no longer with us. The boxer who stung like a bee has stepped out of the ring for good. But his memory will always endure, floating like a butterfly among the world’s consciousness. And that is the ultimate victory. • WSU: A quiet day on the Pullman front, but we do have Ted Miller’s weekly mailbag to pass along from ESPN.com’s Pac-12 blog. ... Former Cougar basketball player Ny Redding is transferring to Wyoming. ... WSU isn't the only Pac-12 school in the state whose athletic department is running a deficit. • Gonzaga: Until Ali died last night, Gonzaga’s 5-1 NCAA tournament win over Arizona State was going to be the subject of my column today. The Zags scored early and Brandon Bailey (pictured) made it stand up as they move on to face regional host TCU today. ... BYU coach Dave Rose says he isn’t worried about his point guard situation. • Empire: One thing about the IFL. You play the same teams often. Tonight, it’s Billings, the only Intense Conference team that has handed Spokane a loss. Jim Meehan has this advance. • Shadow: A group of Whitworth graduates is at the core of this year’s Shadow team. Jim Allen has the story. • Golf: It’s Saturday. It’s warm. And Jim Meehan has his weekly column. This is one of his occasional pro roundtables. • Mariners: Adrian Beltre (pictured) has been a burr in the M’s saddle since he left Seattle a few years ago. Yesterday was just another example of that. The third baseman drove in five runs against Taijuan Walker and the Rangers won 7-3 in Texas. ... If the M’s hadn’t rallied against San Diego, we would have seen position players pitching. • Seahawks: Former Hawk Derrick Coleman will face two felony charges relating to his car crash in October. ... Richard Sherman’s offseason has been notable due to an addition to his family. • Sounders: The U.S. Men’s National team could use at least one more scorer. The team didn’t have any – and hardly threatened – in its 2-0 Copa America loss to Colombia.